Sign up: Auditions for the 2017 Kids’ Variety Show! New Fun Committee Website On Its Way! Valentine’s Day Card-Making Party this Saturday! special art materials you would like to use. will be available to purchase. Join us for Game Night This Saturday! 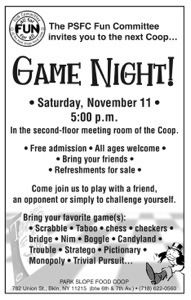 The PSFC Fun Committee invites you to the next Coop Game Night. Free admission, all ages welcome. Bring your friends. Refreshments for sale. The fun starts at 5pm in 2nd Floor Meeting Room of The Park Slope Food Coop. The Annual Coop Kids’ Variety Show is March 9th! Come join the fun committee in celebrating the talented children representing the coop this year. Types of acts include: piano, singing, guitar, drums cello, hip-hop-tap, trumpet, a skit, flute, magic tricks, modern dance and rock ‘n roll. Performers in alphabetical order: Meaghan Accarino, Nadia and Sabine Benjamin, Lochlan Brooks, Vaughn Burgess, Tazha Chen, Cloe Amelia Dean, Ikhari Hinds, Skye James, Ruby Kahn, Mazal and Raven Karlick, Mikayla and Lukas Kennedy, William Lach, Lola and Roman Lafia, Zev Lane, Vaishali Lerner, Naomi Levy, Manuela Mares, Haley McAlpin, Luc and Leila Mieville, Ella Moriber, Jonah Murphy, Jordan Nass-deMause, Ellie Pike, Julian Raheb, Lara Saddique, Zoe Sloan, Eric and Margareta Stren, Lola and Emil Verhulst, Clementine and Graham Vonnegut, and Mia Weiss. Location: Old First Church, Carroll St. & 7th Ave. Admission: $10 adults, $5 kids 12-18, kids under 12 free! Refreshments will be for sale and non-members are welcome. 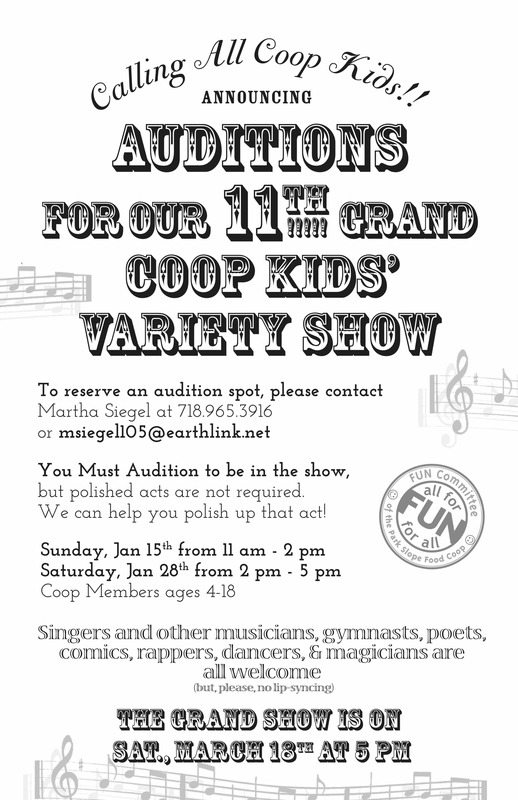 We’re holding auditions for Coop members age 4-18, in the Coop’s second floor meeting room. To reserve an audition spot, please contact Martha Siegel. You can reach her at 718-965-3916 or by email at msiegel105@earthlink.net. You must audition to be in the show. Polished acts not required for audition; we can help you polish it. Singers and other musicians, poets, jugglers, stand-up comics, rappers, dancers. magicians, gymnasts, etc all welcome. No lips synching please. Show is Saturday, March 9th at 7pm in the lower hall of Old First Church. We hope you have a safe and happy New Year!